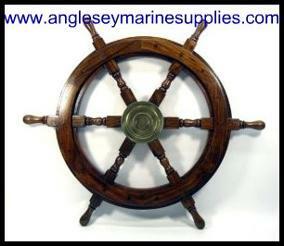 Here at Anglesey Marine Supplies we have the most comprehensive range of Boat, Marine steering wheels available at a very competitive price.Their is plenty of choice available from low cost budget boat steering wheels to the sensibly priced high quality Detmar steering wheel ideal for sports boats and the classy stainless steel destroyer and the acacia wooden steering wheel. 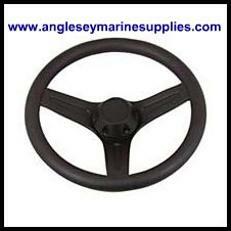 Economy three spoked 120 degree black boat steering wheel. Suitable for small craft and inflatable boats. Available in black or white. 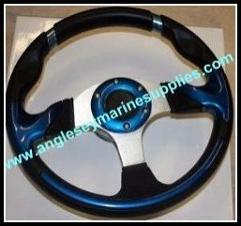 "Grand Sport" marine/boat steering wheel, 320mm in diameter, Black and blue grip with a blue centre and silver spokes. ((HD-5113). 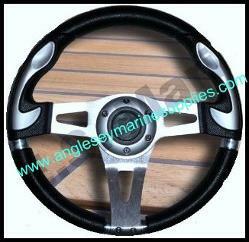 Deluxe sport marine/boat steering wheel, 320mm in diameter, Black and silver grip with silver centre and silver spokes. 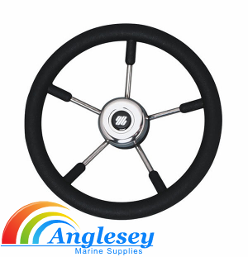 Black four spoke boat marine steering wheel, Outer rim features rich leather grain stitching and finger grips, U.V resistant, fits all standard 3/4" tapered shaft. Diameter is 13 1/2 inch in diameter. Detmar "Legend" four spoke design with soft grip features rich leather grained centre with round custom logo. Leather grain outer with dark buckskin centre. 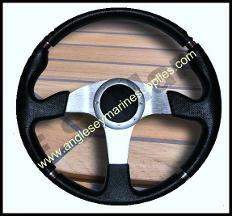 A quality boat/marine steering wheel for that touch of class. 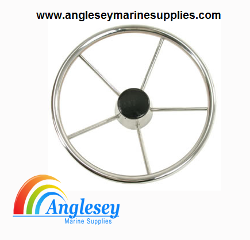 Stainless Steel "Destroyer" marine/boat steering wheel with s/s oval shaped rim for easy holding. Also features plastic centre cap, 380mm (15inch) diameter with 100mm dish depth, Standard 3/4 inch (19mm) diameter tapered shaft. Stainless Steel Cap instead of the plastic cap. 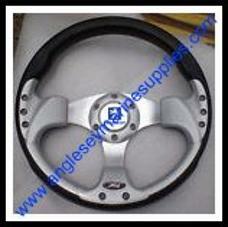 Modena stainless steel marine boat steering wheel covered with polyurethane soft grip rim. 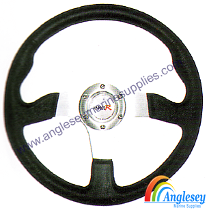 340mm diameter boat steering wheel will fit all standard 3/4 inch (19mm) steering systems. Available in either black or white. Please use drop down menu for purchase choice. 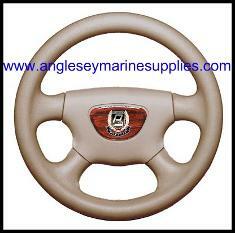 Quality wooden steering wheels, constructed in Acacia wood and laquered. 19mm (3/4 inch) tapered shaft. These wheels can be fitted to any standard steering system, please use drop down menu for size choice. A page dedicated to Canal and Narrowboat users to save you hunting through our website we have selected the most popular items that may appeal to you to save you time hunting through our pages to find them. Quickly find your cabin boat lights, mooring pins and stakes, canal gate lock keys. Also a full selection of canal boat mooring fenders, boat fuel line filters, Canal and Narrowboat 12v electric switch panels, macerator toilets, pumps and fittings. We have recently introduced a selection of solar ventilators to keep your canal and narrowboat cool and fresh during the summer months. New this year include barge poles and canal boat piling hooks and also a large submersible magnet for retrieving lost metal items from of the bed of the canal. We have included more items in our canal boat brass cabin ware to give it the traditional look and feel. Also check out our selection of solar panels ideal for the canal and narrowboat and power inverters as well to suit. We also stock a wide range of maintenance products to keep your canal and narrowboat in tip top condition, cleaning products, oil, greases etc. We hope you enjoy the new page. Canal And NarrowBoat Mooring Fenders canal narrow boat mooring fender Heavy Duty Flat Sided Canal Boat Fender A quality heavy duty flat sided canal boat fender, only 2 1/2" deep with solid eyes, 430mm x 120cm (17cm x 5") ideal fender, space saving. Only £14.99 £12.99 plus postage PayPal - The safer, easier way to pay online. canal narrow boat slimline mooring fender Slimline Round Canal Boat Fender Slimline round canal boat fender from Anglesey Marine Supplies, 40mm diameter by 500mm Quality Item for only £9.99 £8.99 plus postage PayPal - The safer, easier way to pay online. canal narrow boat fender heavy duty Heavy Duty Canal, Narrowboat Rubber Side Fender Heavy duty side fender for more traditional narrow boats, made from solid rubber 20" long x 2" wide and can be positioned either lengthwise or perpendicular to the side of the vessel. supplies with black h/d 3 strand rope, 7 foot 6" long. Available in two different sizes, use drop down menu bar for choice. From only £11.99 £9.99 plus postage Sizes PayPal - The safer, easier way to pay online. narrow boat canal boat hull bow fender Traditional Bow Narrow Boat Fender Traditional canal barge narrow boat fender, made from black synthetic polyester. Has compacted rubber core therefore will not loose its shape. Size 66cm wide x 25mm deep. Has 5mm galvanized chain for attaching to boat. New this season for only £99.99 plus postage PayPal — The safer, easier way to pay online. narrow boat canal boat rope fender Traditional Canal Boat Fender Traditional long button narrow boat fender made from black polyester with blue colour coding. Has compacted rubber core, will therefore not use its shape. Size : 30cm wide x 34cm deep. Has 5mm galvanized chain for attaching to boat. Available for only £109.99 plus postage PayPal — The safer, easier way to pay online. narrowboat canal boat rope fender mooring Traditional Canal Boat Narrow Boat Fender Traditional narrow boat fender, made from black synthetic polyester. Has compacted rubber core therefore will not loose its shape. Size 30cm wide x 19mm deep. Has 5mm galvanized chain for attaching to boat. Available for only £69.99 plus postage PayPal — The safer, easier way to pay online. narrow boat button fender mooring Canal Boat Button Fender Traditional long button narrow boat fender made from black polyester. Has compacted rubber core, will therefore not use its shape. Size : 30cm wide x 34cm deep. Has 5mm galvanized chain for attaching to boat. Available for only £99.99 plus postage PayPal — The safer, easier way to pay online. narrow boat traditional rope mooring fender Traditional Canal Boat Fender Blue Coding Traditional narrow boat fender, made from black synthetic polyester with blue colour coding. Has compacted rubber core therefore will not loose its shape. Size 30cm wide x 19mm deep. Has 5mm galvanized chain for attaching to boat. Available for only £74.99 plus postage PayPal — The safer, easier way to pay online. tipcat fender narrow boat canal boat mooring rope Traditional Tipcat Canal Boat Bow Fender Traditional tipcat fender. Size : 66cm long x 25cm wide. Traditional narrow boat fender, made from black synthetic polyester. Has compacted rubber core therefore will not loose its shape. Has 5mm galvanized chain for attaching to boat. Available for only £109.99 plus postage PayPal — The safer, easier way to pay online. Boat Fender Hooks And Eyes canal narrowboat fender hooks Boat Fender Hooks From Anglesey Marine Supplies Boat fender hooks made from hard plastic to fit on the boat side or safety cable side cables. Sold in pairs. Currently only £6.99 £5.99 per pair plus postage PayPal — The safer, easier way to pay online. canal narrowboat fender hook Boat Fender Hooks From Anglesey Marine Supplies Boat fender hooks made from hard plastic to fit on the boat pulpit or hand rails. Sold in pairs. Currently only £6.99 £5.99 per pair plus postage PayPal — The safer, easier way to pay online. fender hook eye chrome Chrome Plated Boat Fender Hooks Cost effective boat fender snap hooks. Chrome plated for maximum protection. Originally £4.99 Now Only £3.99 Each PayPal — The safer, easier way to pay online. boat fender eye plates chrome bronze gunmetal Boat Fender Eye Plates Boat fender eye plates available in a selection of mounting plates and finishes. All eye plates are gunmetal either bronzed or chromed. Available in two or four hole mounting plates. Available for only £2.99 each plus delivery Type PayPal – The safer, easier way to pay online. Mooring Stakes And Pins mooring stake pins stakes canal boat Galvanised Steel Canal Boat Mooring Stake 24" long mooring stake,16mm solid round bar, fully galvanised with eyelet. Ferrule welded on top to prevent the mooring stake from mushrooming when hammering in. Buy more and save money. Low Low price from only £9.99 £6.99 each plus postage Quantity PayPal – The safer, easier way to pay online. heavy duty mooring pin stake canal boat narrowboat Heavy Duty Mooring Stake Spike 19mm Diameter Heavy duty mooring stake spike 19mm diameter solid round bar, fully galvanized, 600mm long with welded on eyelet. Buy more and save money. Available from £7.99 plus postage Quantity PayPal – The safer, easier way to pay online. boat mooring compensator boat mooring compensator Boat Mooring Compensator Mooring compensator epdm to accept rope up to 20mm in diameter. Only £14.99 £12.99 plus postage PayPal - The safer, easier way to pay online. Canal Boat Mooring Piling Hook Canal piling hook with ring for canal moorings. Buy multiples for better price. Available for only £7.99 plus postage Number PayPal — The safer, easier way to pay online. mooring spring compensator canal narrowboat Mooring Spring Compensator Mooring spring compensator, accepts rope up to 20mm in diameter. New introductory price only £18.99 plus postage PayPal — The safer, easier way to pay online. boat marine galvanised chain narrowboat mooring canal boat Hot Dipped Galvanised Short Link Chain DIN 763, DIN 5685 Hot dipped galvanised short link chain ideal for marine moorings and anchors, supplied in bags in 15 metre lengths. From only £45.99 £39.99 plus postage Chain Thickness PayPal — The safer, easier way to pay online. Narrowboat Cabin Lighting narrowboat canal boat wall light Canal & Narrowboat Lacquered Brass Wall Light A quality lamp with a touch of elegance, a polished brass laquered finish cabin wall light with a translucent plastic shade. Has a inbuilt switch fitted. 12 volt 10 watts. Dimensions are Base diameter=70mm, Shade diameter 55mm, Shade length 100mm. Was £27.99 now only £24.99 while stocks last PayPal — The safer, easier way to pay online. narrowboat cabin reading light boat canal Canal & Narrowboat Brass Lacquered Cabin Reading Light Fully adjustable brass lacquered boat cabin reading light, with built in switch. Uses 20 watt halogen 12v. beam. Easy to fit. Available for only £31.99 plus postage PayPal — The safer, easier way to pay online. narrowboat Boat Cabin reading lamp light Canal Narrowboat Boat Cabin Reading Lamp Light Boat cabin brass reading light as a 90mm diameter pre-drilled base for mounting. 12 volt 10 watt bulb. Available now new this season only £29.99 plus postage PayPal — The safer, easier way to pay online. narrowboat Canal Boat bed reading light lamp twin Canal & Narrowboat Bed Cabin Reading Light Lamp Boat cabin bed ready light. Gold swivel bed light with pearl bulb, c/w switch. Also ideal for motorhome, horseboxes and caravans. Also available as a single bulb and switch, please use drop menu for choice Available from only £9.99 plus postage Type PayPal — The safer, easier way to pay online. canal narrowboat domed cabin light teak brass Canal & Narrowboat Domed Cabin Light Teak and brass domed cabin light, comes all complete with bulb, shade etc. As a built in switch. Originally £34.99 now only £32.99 plus postage PayPal — The safer, easier way to pay online.